Isis Mikhail, M.D., M.P.H., Dr.P.H. Q: Would you briefly describe your educational and professional background? After graduating from Cairo University Medical School in Egypt in 1980, I came to the United States and completed my clinical boards. I then received a scholarship from the University of Alabama at Birmingham (UAB) and completed my M.P.H. in epidemiology in 1990. After graduation, I worked on epidemiologic studies and clinical trials in many areas of health: chronic diseases (heart disease, diabetes), genetics (Alzheimer’s, narcolepsy), and rheumatologic disorders (rheumatoid arthritis, lupus, fibromyalgia). While working as director of the WILLOW Project, an HIV trial funded by the National Institutes of Health (NIH), I pursued a doctoral degree in UAB’s Department of Epidemiology and International Health. In 2003, I received my Dr.P.H. and was honored as the outstanding doctoral student of the year. All of these experiences prepared me for my positions here at NCI. Before coming to OCCAM, I was a program director and epidemiologist at the Clinical and Translational Epidemiology Branch of the Division of Cancer Control and Population Sciences at NCI. In that role, I focused on stimulating research on rare cancers and worked on projects related to chronic diseases and cancer, cancer risk, outcome, and prognosis. 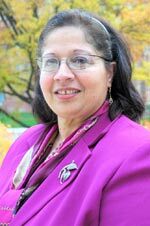 I served as chair of the Health Disparities Interest Group and was a member of the Special Studies Institutional Review Board. Q: What does your new role at OCCAM include? My main role as director of the Research and Development Support Program (RDSP) is to coordinate, support, and expand OCCAM’s extramural research activities and grant portfolio. This can be achieved by developing new initiatives and collaborative funding opportunities with other NCI and NIH programs. Also, communicating with CAM researchers and attending and organizing meetings and workshops will be important for me to build bridges with this research community. Such efforts can promote innovative research and support new investigators to conduct rigorous research. I will also emphasize OCCAM’s new research priorities, which include the identification of novel therapeutics for the pharmacopeia of traditional medical systems, as defined by the World Health Organization; the use of complementary approaches to improve the therapeutic ratio of standard and investigational anti-cancer therapies; and research on lifestyle modifications (e.g. diet, exercise, and mind-body approaches) for their impact on cancer outcomes (e.g. response to conventional cancer therapy and survival). Q: How did you first become interested in CAM? How has that shaped your career? Having grown up in Egypt, I was exposed to CAM early on. The use of CAM therapies, such as ancient Egyptian remedies, for general sicknesses is a way of life there. Also, my father owned an export business where he exported medicinal herbs to a pharmaceutical company in Germany. I can still remember hearing about herbals such as chamomile and cardamom. I also learned that certain herbs have potencies based on where they are planted, when they are planted, and the soil used. During my medical education, I learned that many commonly used medicines have herbal origins. However, conventional medical education did not include CAM in its curriculum. My interest in CAM was revived when I selected the topic of my doctoral dissertation—CAM use among HIV-positive women in association to their clinical disease indicators. I worked on CAM topics during my fellowship and am continuing with it here at OCCAM. Q: What visions do you have for the Research Development and Support Program? I would like to expand OCCAM’s extramural research portfolio and see more robust research in the field of cancer CAM. This can only be achieved through collaboration—inter- and trans-disciplinary, within and outside NIH, and both nationally and internationally. RDSP can play an instrumental role in helping to foster such research collaborations that can result in increased recognition of CAM use by conventional health care professionals. With more rigorous and evidence-based research available in the future, I envision that CAM will be more recognized and incorporated as part of conventional cancer treatments.